hi- i just found your blog too (googled adventures in home cheese making). i used to make cheese here in maine at silvery moon creamery. im just about to start a blog about my own adventures in home cheese making - and other fermented goodies. i look forward to perusing your archives. we used to use crockpots for waxing. they were deep enough, we didnt have to clean them out after every use and they stayed hot enough. it is a challenge to lift a 8-10lb wheel into a pot of wax but you get great arm muscles! 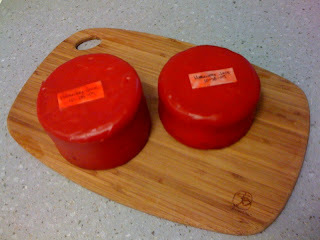 My goodness--it sounds like waxing cheese is quite the adventure :-) Your end result is beautiful! @LeslieMichele -- Feta is actually a GREAT cheese to start with! I've followed Ricki Carroll's Feta recipe with good success. The texture has been softer than the store-bought stuff (not so crumbly, but still firm enough to hold a cube shape). More importantly, though, the flavor has been outstanding. @Little Bunny -- Do crock pots get hot enough? I'm under the impression that you want the wax as hot as possible (over 200F if possible) to make sure it's sterile and to help kill any mold that might be on the surface of the cheese when it's applied... And please keep me posted on your home cheese making fun! 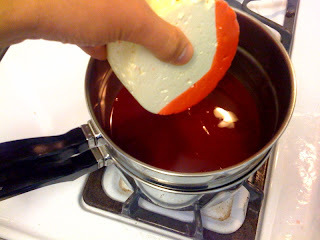 Can I use paraffin instead of the red cheese wax?? If you do try the paraffin, please let us know how it worked!